Since 2003, Union de Vecinos members have engaged in various campaigns and activities to transform public spaces to create healthier and safe environments. This strategy continues and community members look for additional spaces which can be repurposed to address community needs. 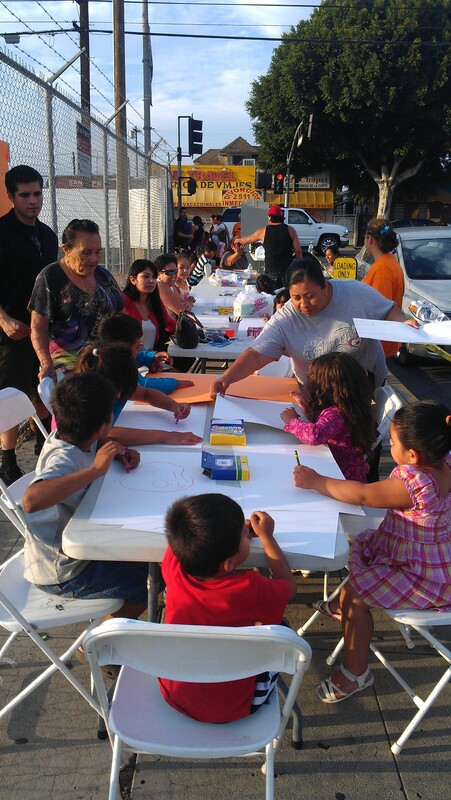 Three years ago, Union de Vecinos identified various vacant lots in Boyle Heights to develop parks. One of these lots is located on the corner of Fickett and Cesar Chavez where Union de Vecinos members designed, built, and installed benches and tables to change how the sidewalk on that corner was used. The lot is owned by the MTA which demolished homes for over 200 families and left lots vacant and abandonded since the opening of the Goldline. Over the last couple of weeks, community members organized activities to show how this space can be transformed from a vacant lot into a community space that includes activities for children and families. Todays activities were organized by our Unido Para Siempre Neighbohrood Committee to engage children in expressing what they would like to see in that space that can benefit them. Further down the round at the vacant lot on 1st and Boyle (owned by the CRA) our Alegria and Progreso Neighborhood Committees organized a movie night to show that open spaces should not just be left fenced in and shutoff from community members and should be repurposed to address community needs.